In 1948, the library at Fairfield University under the leadership of Librarian Robert Gaffney, boasted over 5,000 books and a panoramic view of the Long Island Sound from the windows of Berchmans Hall. With a new Librarian, Robert Barrows, it moved in 1949 to two rooms in Xavier Hall. Father Francis A. Small was named Director of Libraries in 1952, a position he would hold for over two decades of great change. Father Small led the move in 1957 to Canisius Hall, where the library remained for a decade. During this move, the science library was to stay in Xavier Hall. It was under the leadership of Father Small that the library began a microform collection, purchased its first electronic typewriter, and developed a procedure for duplication catalog cards. More detailed information about the new building can be found on the Floor Plan. Groundbreaking for a library building took place in 1967, with the building opening the following year. The new building was planned with an estimated 20 years worth of space to grow. With the opening of the new building in 1968, the library increased its capacity from 90,000 to 300,000 books. It featured a smoking area, two typing rooms, and its first full time reference librarian. In 1971, the library was named Nyselius Library in honor of benefactors Gustav and Dagmar Nyselius. They were Swedish immigrants who had settled in Stamford and wanted to make a donation to Fairfield University to repay in part the kindness of their adoptive country. At the time of donation their gift was the largest ever given to Fairfield University. In 1973, the library joined OCLC, an online cataloging service that provided access to a database as well as printed catalog cards. In 1974, Barbara Bryan, then Associate Director, was named University Librarian. The library added a media department in 1980, thanks to a grant from the Gladys Brooks Foundation. In 1982 it joined the Bibliomation consortium, which introduced barcodes and wands to replace handwritten sign out slips for checking out books. The library's first computer lab opened in 1986, offering access to 8 Apple computers. Steady technological improvements continued to augment the library-a CD-ROM reference center in 1990 thanks to the Gladys Brooks Foundation; a CD-ROM LAN in 1991 thanks to grants from the E.L. Cord Foundation and the George I. Alden Trust; an online public access catalog in 1993; and a computer lab with 25 workstations in 1997. In 1996, James Estrada became the University Librarian and took the lead on the library expansion and renovation project. After long and careful planning, July 1999 marked the groundbreaking ceremonies for the library expansion, an undertaking supported largely by a gift from alum Joseph A. DiMenna, Jr. '80. The project neared completion as classes started in the fall semester of 2001, thanks to the leadership of Estrada and Director of Library Services Joan Overfield. 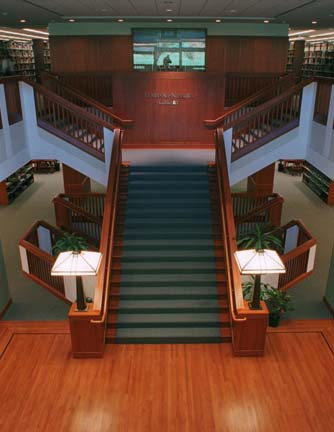 In the fall of 2001, the DiMenna-Nyselius Library officially opened, ushering the library at Fairfield University into a new era. In addition to nearly doubling in size, it is fully wired and proudly offers state of the art technology.